Mistletoe has long been used as a Christmas decoration — but did you know that it has medicinal qualities, not the least of which is its ability to cure cancer? Mistletoe is a semi-parasitic plant that grows on apple, oak, and other broadleaf trees in Europe, Asia, America and Korea. It bears white glutinous berries in winter. 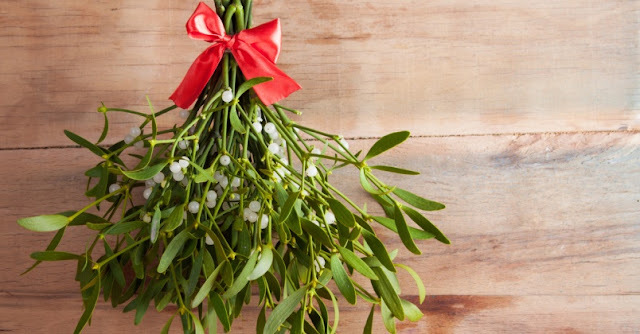 Mistletoe has traditionally been known as the “kissing herb” because it’s customary to kiss someone under the mistletoe, a practice that originates from a Scandinavian legend of Balder, the god of Peace, who was slain with an arrow made of mistletoe. He was restored to life at the request of the other gods and goddesses, and mistletoe was thereafter given into the keeping of the Goddess of Love. It has since been ordained that everyone who passes under a mistletoe should receive a kiss, to show that the plant had become an emblem of love, and not of hate. It's interesting enough to know that this herb can actually cure cancer! WOW!!! 襤 I stumbled across this article and am going to share the link for you to read.